Potential for unexpected release and hazardous uncontrolled swinging of the skip and overbalancing of the skip lorry. This can occur when the tipping hooks fail to engage with the catch bar on the skip but temporarily snag on a lip protruding from the base of the skip instead. 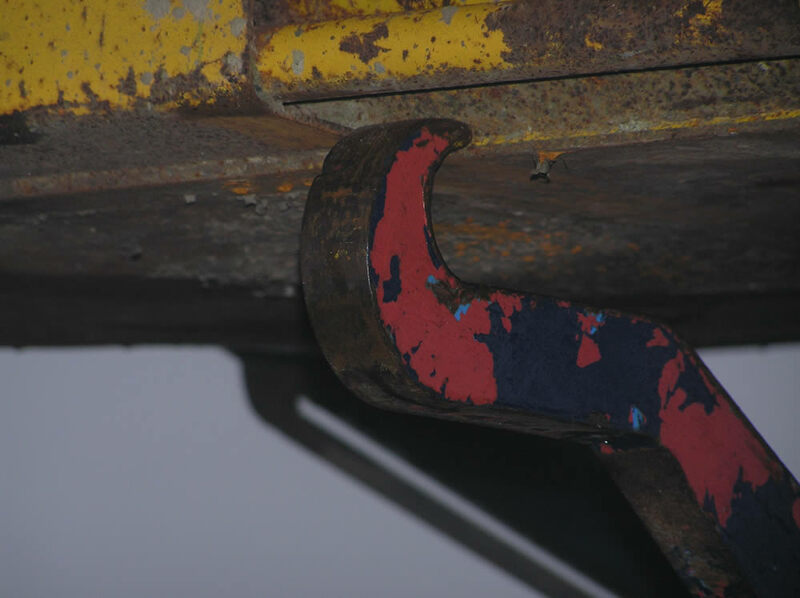 During tipping the hooks are pushed off the lip which releases the skip causing it to swing, the momentum of which may cause the front of the lorry to lift and may result in the lorry overbalancing. Skips should be examined and modified as applicable so as to ensure the hooks engage only on the catch bar. Skip containers are used widely across the waste and recycling industry. This safety notice highlights a potential danger whereby fabrication of the skip can result in a lip on which tipping hooks may 'falsely' engage and provides advice on corrective actions. 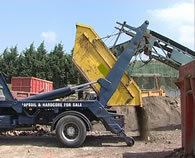 It is a common arrangement for skips to be suspended by four chains attached in pairs to two loading arms on the lorry which straddle the skip. The loading arms are hydraulically actuated such that they either rotate forwards to lift the skip onto the lorry or backwards to off-load the skip onto the ground. There are no nationally established standards (e.g. British Standards) for the manufacture of this type of skip which are generally fabricated from steel plate. Often the base plate extends beyond the end plates producing a lip. A hazardous situation can occur if the tipping hooks fail to engage with the tipping bar but instead 'snag' on the lip (see photograph 2). This false engagement of the hooks is not necessarily visible from the operating position and, superficially, will behave like a proper engagement until an angle of tipping is reached whereby the hooks are pushed off the lip. 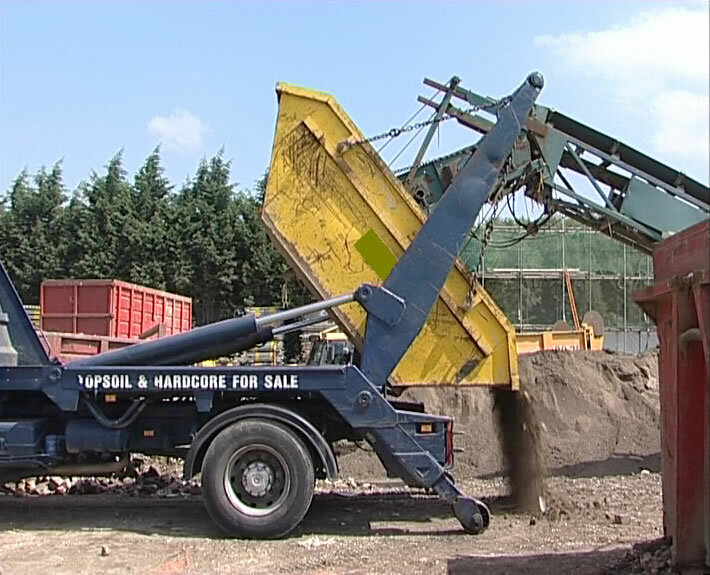 When the skip is no longer restrained it will swing-out over the back of the lorry, the momentum of which could lift the front of the lorry off the ground. The potential for the lorry to overbalance is increased where there are shortcomings in the deployment, positioning or function of the stabilisers. The immediate risk is to the operator because of their close proximity due to the controls being typically positioned at one side of the lorry. Although there is not a nationally established standard, the Container Handling Equipment Manufacturers (CHEM) Association have produced a technical standard TS14 "Standard Specification for Skip Containers" which manufacturers should find useful. In section 4.6.3 it states, "There must be no projection of the base plate in the area of the tipping hook engagement with the tipping bar thus preventing inadvertent hooking on the skip." Existing skips should be examined and where a protrusion exists that could give rise to false engagement with the tipping hooks it should be removed from that area and the fabrication made good. New skips should be manufactured without a protrusion that could give rise to false engagement with the tipping hooks (in line with the CHEM association standard TS14). Instruct driver-operators to perform a visual check to ensure the proper engagement of the hooks on the catch bar during tipping-out. Instruct driver-operators to routinely check skips and skip loader vehicles and to report any defects. Please pass this information to a colleague who may have this Product/ Equipment or operate this type of system/process.